Synopsis: A mother and a father take their kids to their beach house expecting to enjoy time with friends. But their serenity turns to tension and chaos when visitors arrive uninvited. Review: I don’t think anyone expected 2017’s Get Out to be the massive critical and commercial hit it eventually became. Though the early trailers looked intriguing, it’s January release and low-grade buzz didn’t cause Hollywood to give it much more than a second glance. Besides, did one half of a television comedy duo have the goods to deliver a social commentary thriller in his first time out of the gate as a writer/producer/director? Well, a huge box office take, multiple memes, endless cultural analysis, and an Oscar later I think Jordan Peele proved he had more than an inkling as to what he was doing. 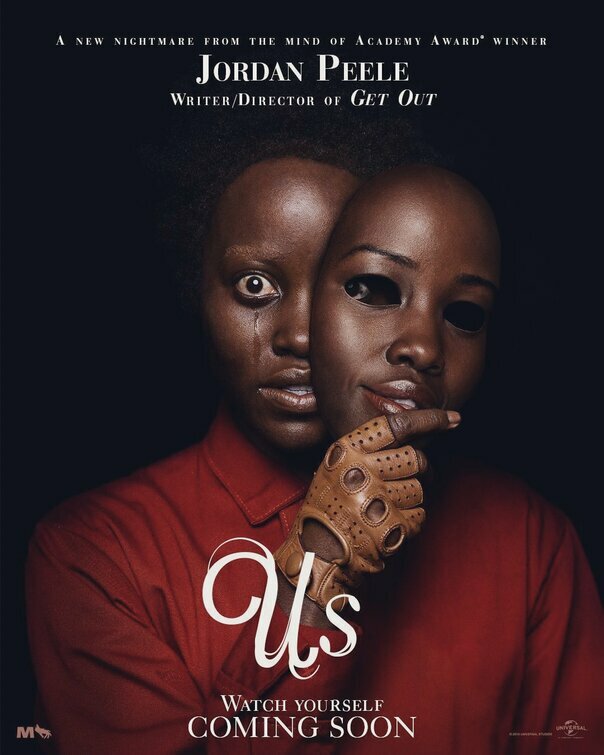 So when his second feature, Us, was announced, everyone held their breath to see if the sophomore slump would strike someone everyone was now rooting for. A mere two years after Get Out landed with a bang Peele is back with a film that’s bound to be compared to his previous work but is actually a different experience all together. Where Get Out was a slow-burn thriller, a clear (and clever) response to the then current political climate when it was made, Us is pure horror and doesn’t dig quite as deep into what divides us as a community but instead turns the attention into what defines us as individuals. It’s no less thought-provoking but is resolutely aiming for any exposed nerve where it can strike…and strike hard. Arriving at their California lake house outside of Santa Cruz, Adelaide (Lupita Nyong’o, Non-Stop) and Gabe (Winston Duke, Black Panther) are ready for a serene weekend with their children Zora (Shahadi Wright Joseph) and Jason (Evan Alex). It looks to be an ordinary few days. The kids bicker like most siblings do while the parents settle in. Gabe has bought a boat he wants to take for a spin around the lake but first he has to convince Adelaide to spend the day at the beach with their casual friends Kitty (Elisabeth Moss, The Old Man & the Gun) and Josh (Tim Heidecker, Ant-Man and the Wasp). Yet there’s something about the beach at Santa Cruz that puts a knot of fear into Adelaide…and we’ll soon find out why. To give away much more than that would possibly delve into spoiler-territory and I wouldn’t want to reveal any of the secrets the film has been wisely holding back in its carefully curated promotional materials. What I can tell you is nothing the previews haven’t already given away. Another foursome confronts Adelaide and her family on their first night, a family that looks an awful lot like them, a family that may have a link to a traumatic incident from Adelaide’s past that has come to haunt her present, a family we come to know as The Tethered. And they have a rather unique score to settle. Peele drops clues to what’s happening along the way but most are only obvious in hindsight as you drive home or start to discuss the film in the parking lot with your friends and loved ones. Like Get Out, Us will be a movie that is fun to dissect long after it’s finished and already ranks high on the re-watchability scale. I also appreciated that Peele kept the movie mostly within the realms of acceptable reality. This is not a supernatural movie where people walk through walls or events occur that are totally unable to be explained. It amps up the tension and makes you feel like what’s happening could conceivably take place. Even if all the pieces don’t quite line up under our modern microscope, there’s enough giddy ways that things fall into place that I was able to forgive the elements that didn’t quite get resolution. While Get Out was a fairly solid movie considering the budget and novice of those involved, Us represents a leveling-up of all elements. Peele’s already present confidence as a writer and director has grown even more, this is clearly an individual that knows his film history and respects the process. He has an eye for what looks good and crafts several sequences that are not only technically difficult to construct but are visually impressive as well. Everything just looks wonderful in Us. The production design, costumes, cinematography, and score are all key players here and add to the overall effect the film has on its audience. If any of these areas were weak it would have left the film feeling off-kilter in unintended ways. So many horror films that take place in the dark are hard to see but even in dark settings you can follow everything that takes place (though you may be watching it from behind your fingers covering your eyes) and Peele blessedly sets many scares in the stark daylight. Nyong’o already has an Oscar for her devastating work in 12 Years a Slave and if I had any say in the matter she’d be in the running for another one for the stunning work she turns in here. Playing a dual role that requires her to play two very different sides of a complex coin, she separates the characters so much that when she shows up for the first time as her other character I actually didn’t believe it was her at first…even though I knew it was. It’s a total transformation and though through the wonder of special effects she can share the screen with herself it feels like there are actually two actresses on screen with one another at the same time. Both roles are infinitely challenging and tightrope walking in their level of skill and I can’t imagine any other actor working today who could have done what she did with them. As he did on his first film, Peele demonstrates a keen eye for casting and has filled the rest of his cast with standouts from top to bottom. Duke is a great match of Nyong’o, he’s a laid-back dad and supportive spouse that holds his own with his formidable co-star. Joseph and Alex make good on going the extra mile in difficult roles for young actors and complete a convincing family unit with Duke and Nyong’o. In their small supporting roles, Moss and Heidecker are appropriately awful in their triteness. Moss especially seems to enjoy basking in her California housewife attire and saying things like “it’s vodka o’clock”…something you know the actress has never said (and would never say) in her entire life. A huge part of the fun in Us will be for audiences to experience it in theaters with a crowd. While Get Out worked like gangbusters on the big screen for an initial viewing, it’s thriller nature leant it to play just as strongly if you saw it for the first time at home. Yet I think Us will best be enjoyed first and foremost if you’re shoulder to shoulder with another person getting the same jolt you are. Couldn’t agree more with your comments about experiencing this one at the cinema, plus it’s always fun to hear other people’s reactions once it’s over!